On this half-day excursion, you can see the Fondation Claude Monet at your own leisure. The tour leaves from our office near the Louvre, where you’ll be given an audio guide for the visit. After about a 1 hr. 30 min. trip through the verdant countryside, you will arrive in Giverny. 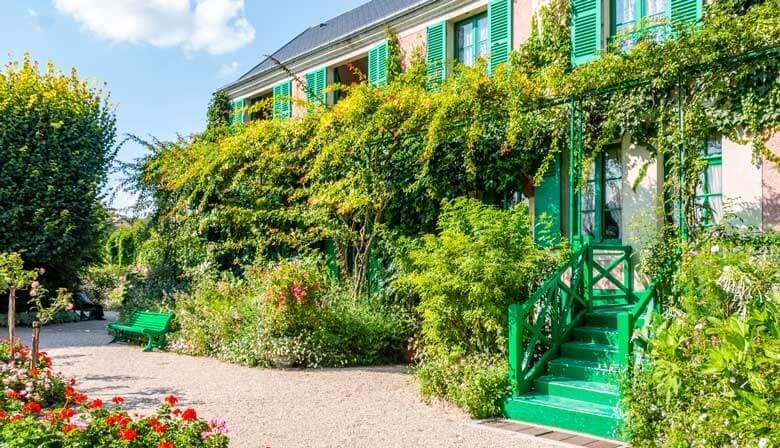 You will have two hours to tour Monet’s home, his studio and vibrantly colored gardens. The visit continues with a stroll through the luscious Monet garden, which was the main source of inspiration for this indisputable founding father of impressionism. During this walk, you can listen to audio guide commentary about Monet’s life, works and career. Take in the vibrant flower-lined central path, which is surrounded by roses, nasturtium, and flowerbeds of all kinds, offering a wide spectrum of color. Cross the Clos-Normand, where you will find flowers from the Far East. Finally, you’ll come upon the magnificent water garden, famous for its water lilies, weeping willows, and the celebrated Japanese bridge spanning the pond. Monet's Garden is a place filled with poetry, and is like a wonderland where people can leave the ordinary behind. The various flowers and plants within the garden compete with one another in splendor, and in the pond one can see Monet's famous water lilies and the Japanese-style arch bridge over the pond. The flowers and plants laid out in order in the Normandy-style flower garden in front of his house are a cavalcade of colors, wherein the greens within reds within yellows came out in the artist's brush. Going down the path, you witness a truly lovely sight! Monet's lily pond is like a Japanese garden, a world where willows and green bamboo, flowers and greenery reflect in the water, and the flowers clustered and hidden under willows among the bamboo evoke universal praise! Standing on the red arch bridge and gazing at this view is a calming experience, and it is not difficult to imagine the scenes of Monet's masterworks in the Orangerie! Interesting to hear on the bus ride to Giverny. The bus ride was pleasant, as was the guide. Giverny was lovely, but I do wish that we had better information about the village itself. Monet's home and gardens were wonderful. Beautiful location but tour was not quite long enough. Excellent tour, excellent value. The bus ride was enjoyable (even the fact the bus driver took a wrong turn and we got loss). We did the self guided tour with the headphones and that was very good. Bus was clean and safe. Female “guide” was impatient and rude! Cost was very high. Cannot see advantage to using Paris CityVision. Next visit to Giverny will take train and bus to Giverny, as before - very affordable.